For those of you who read the title and are thinking to yourselves, “He plans to become ghost?”, yes, I do. 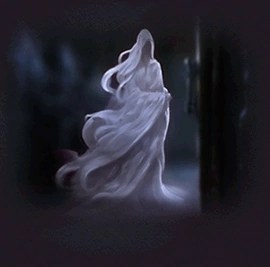 I plan to become a ghost and haunt people as I like. Nobody’s safe, too. I plan to haunt everyone and anyone! Mwha ha ha! Anyway, most people who know me know that besides being a fan of horror stories, I’m also a believer in ghosts and have had a few experiences as well that terrified and excited me (though mostly terrified). I thought it’d be interesting if I did a list of ten places purported to be haunted that I want to visit and see if I can capture ghostly evidence. And it’s possible that I might be able to go to a few of those soon, so I’m super-excited for them! So without further ado, let’s get this list started! The oldest working inn in America, the Wayside Inn gained its name as it was the place that Henry Wadsworth Longfellow wrote his collection of poems, Tales of the Wayside Inn, back when it was the Howe Inn. There is another tale though of this historic inn: the inn is reportedly home to Jerusha Howe, the daughter of the inn’s original owner who fell in love with a sailor who disappeared at sea. She died pining away for her missing lover. Today, male guests at the inn report being visited by Jerusha in two adjoining rooms she is said to frequent, leading to some amorous ghost stories that have been collected in a trunk full of love letters in one of the rooms. You can see why I’d want to go there. It’s the making of a great supernatural romance story, among other things. Lizzie Borden was a woman living in Fall River, MA with her family in 1892 when her family was brutally murdered with an axe. The violence of the massacre and Lizzie’s subsequent strange behavior afterwards made her seem like a prime suspect, but bungling on the part of the local investigators led to her acquittal at trial. The case gained quite a lot of attention in its day, making it one of the most infamous murders in American history. Today the house is a working bed and breakfast, and guests have reported being dragged from beds and other unpleasant happenings. Doesn’t that sound like it’s right up my alley? *This location was visited July 6th-7th, 2017. Full report of that experience here. America’s most famous federal prison, it held numerous famous criminals, including Al Capone, from 1934 to 1963. Today the prison is a landmark and a museum (and it was also a short-lived TV show), but it’s also reportedly haunted by former inmates who died here, sometimes under mysterious circumstances. Not only that, but the island was called by Native Americans “the Evil Island” and rumors of demonic activity continue to this day. I can imagine wanting to spend a night in the big house if it was this one! I’m proud to say that this one is in my state, and haunted tours are regularly given there around Halloween, so I’m definitely going to visit it one of these days. During its heyday, this prison housed over 155,000 prisoners, and there were several mysterious deaths, murders, and suicides. Since it closed, it has been used by film crews for a variety of films, including the Shawshank Redemption, but it has also been the home of some very nasty spirits who are said to touch prisoners and even become violent. Maybe I should visit there this Halloween. Anyone care to come with? *This location was visited August 5th, 2018 (and will likely be visited again soon). For full details, check out my post here. The inspiration for Stephen King’s The Shining, the Stanley Hotel has been the site of many paranormal experiences, with people becoming so frightened they’ve had panic attacks and have been sent to the hospital. Some of the most famous haunted rooms are the ballroom, where music is said to be heard, and Room 217 (any King lover knows why). There’s also a reported ghost thief that steals luggage, jewelry, and othe valuables from right under the guests’ noses, and there’s been no proof it might be a maid. They had me at Stephen King. One of the most haunted sites in America, the Trans-Allegheny Lunatic Asylum was one of the busiest insane asylums in the nation, housing 2400 patients at its peak. It was forcibly closed in 1994 due to treatment of its patients, but popular belief states that some guests haven’t left. There have been screams, doors opening and closing, and a bunch of other weird happenings there, and it has been investigated by numerous paranormal investigators, including the Ghost Adventures Crew, who did a live seven-hour long lockdown during which viewers on the Travel Channel website could view and examine evidence in real time. And I think it’s about time I got committed there, don’t you think? An asylum for the physically and mentally handicapped, Pennhurst was plagued by overcrowding and not enough staff members for all its years. There are reports of children five or six years old not being taught to walk because there weren’t enough staff members to teach them, and of patients lying in their own feces or delusions for hours on end. The facility was finally closed when an investigative news team exposed the overcrowding and abuse there, leading to a public outcry. Today the facility is reportedly haunted by patients who never left its walls, and tours and investigations there have yielded some interesting findings. As one of those investigations inspired a novel I plan to write someday, I hope to get a tour someday. Road trip! An ancient forest at the base of Mt. Fuji, the forest is nicknamed “Suicide Forest” due to its popularity as a place for suicides, despite official’s efforts to stop visitors from killing themselves. It is said that in addition to the suicides, the forest is haunted by demons and yurei, spirits who have been unable to move onto the afterlife. If I ever tour Japan, I’m making this place a sure location to visit. Only Godzilla could keep me away! A series of man-made caverns that extend very deep underground, the Hellfire Caves were once the stomping grounds of the Hellfire Club, a group of politically and socially affluent figures led by Sir Francis Dashwood, who reportedly held a number of pagan rituals in the caverns. Some accusations against the group say that these rituals were satanic in nature. To this day there are reports of dark spirits in the caves, as well as reports of Sukie, the ghost of a woman who was accidentally killed by three village boys who lured her to the cave and a rock fight broke out, as well as the ghost of Paul Whitehead, a friend of Dashwood’s who asked that his heart be put in an urn in the caverns upon his death. When the heart containing his urn was stolen in 1829, reports of a man in 18th century garb sighted in and around the caverns started to crop up. I wonder whose heart he’s looking for? Because these caves have certainly stolen mine. *This location was visited on May 21, 2014. For a full account of that experience, click here. Have you ever been to these or other haunted locations? Has anything happened to you? If it did, could you give us some detail? Every time we go to Paris (three times now) we try to get to the catacombs, but no matter what time of year we go, the lineups are MAD. So we have not gone. If you go, you have to share that story. Oh trust me, I plan to. And if I end up taking any photos from the catacombs and there’s something spooky in one of them, I’ll post those too. I do hope you get to see number one on that list. Really wish I had when I was there. I’ll definitely try to get down there. And when I do, I’ll take plenty of photos. Good, a brief spot in Modern Warfare 3 is the closest I’ve ever come, and that game did seem inaccurate when it came to scale and proportion. I noticed this when I was in Paris and looking upon the Eiffel Tower. I don’t play a lot of video games, so I’m the worst person to make a comparison like that. I will let you know what they are really like though. It should be a t on of fun.